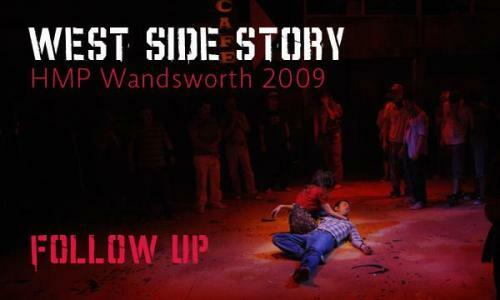 In March 2013, Pimlico Opera will be staging Westside Story in HMP Erlestoke, Devizes in Wiltshire. The cast, largely made up of prisoners, with a core team of a professional director, a few professional singers and backstage team will perform Westside Story to the paying public in the prison. It is something that Pimlico Opera has been doing, admirably, for 20 years, all without public subsidy. Each project in prison displays the ability of art to change lives, the prisoners receive coaching and gain in dignity and self-esteem. It can all seem a little worthy on paper, until you go and experience it for yourself. Galas are funny things, and must be a nightmare to put together; trying to assemble a a coherent evening around a series of snippets made tempting by the star names singing, but dependent on diaries and personalities. Last night's gala at Covent Garden, Our Extraordinary World (30 October), was given in the presence of HM the Queen and Prince Philip and was intended both to celebrate the Queen's Diamond Jubilee but also the whole of the Covent Garden enterprise, both on-stage and off. There was also the feeling that it marked the launch of a new era, with Kasper Holten as Director of Opera and Kevin O'Hare as Director of the Royal Ballet. The offerings of opera and ballet were evenly balanced, with some tempting new pieces being created specially for the occasion. Interleaved with all of this were short video compilations of interviews with everyone connected with Covent Garden, dancers, singers, backstage staff, Friends of Covent Garden, education, community, indeed a celebration of the whole enterprise. Derry-Londonderry's role as City of Culture 2013 will be celebrated next year with a new cantata from Mark-Antony Turnage with words by the Pullitzer-prizewinning Northern Irish poet Paul Muldoon. The cantata will be premiered simultaneously in London and in Derry-Londonderry on 3 July 2013, with performances at the Guildhall in each city. The cantata, At Sixes and Sevens, will be performed at the Guildhall London by the London Symphony Orchestra and in Derry-Londonderry by Camerata Ireland directed by Barry Douglas. From 8 to 10 November, the Royal Greenwich Early Music Festival is taking place in an around the Old Royal Naval College in Greenwich, whose buildings are now home to the University of Greenwich and the Trinity Laban Conservatoire. 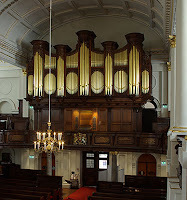 (the festival is jointly promoted by the Early Music Shop, the Greenwich Foundation and Trinity Laban Conservatoire of Music and Dance) The festival involves concerts in the college (in the Painted Hall and in the Chapel) and in St Alfege's Church in Greenwich, plus an exhibition, the largest Early Music Exhibition of its kind. This year performers include His Majestys Sagbutts and Cornetts, the Trinity Laban Classical Orchestra, Philomel, the Sixteen, Eva Fegers, Dan Laurin, the Rose Consort of Viols and the European Union Baroque Orchestra. My review of Johann Hermann Schein's Israelsbrunnen, his influential collection of motets performed by the Dresdner Kammerchor is here, on MusicWeb International. My career has included a number of forays into cabaret, as composer, arranger and artistic director and I am always impressed with people who can make the genre work in new ways. I loved Mary Carew and Philp Mayers disc Serious Cabaret but missed their performance at Kings Place last month. Now they return with their programme for two further engagements this weekend at the CBSO centre in Birmingham on Friday 2 November, and at the Oundle Festival on Saturday 3 November. Or you could always simply buy the CD, its one of my favourites, a wonderful mixture of cabaret items old and new with some great discoveries and some lovely arrangements (Diamonds are forever to William Bolcom, Friedrich Hollander to Marc Blitzstein, taking in Zemlinsky and Stefan Wolpe on the way. Serious Cabaret is on the Orchid Classics label. 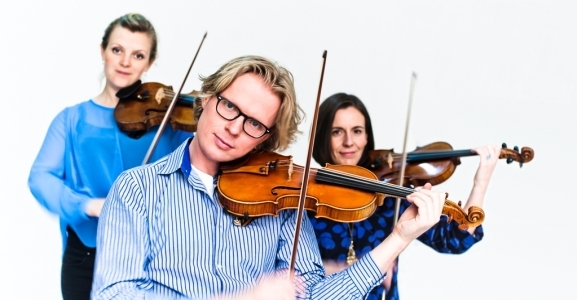 The Scottish Ensemble are making two visits to the Wigmore Hall this season. 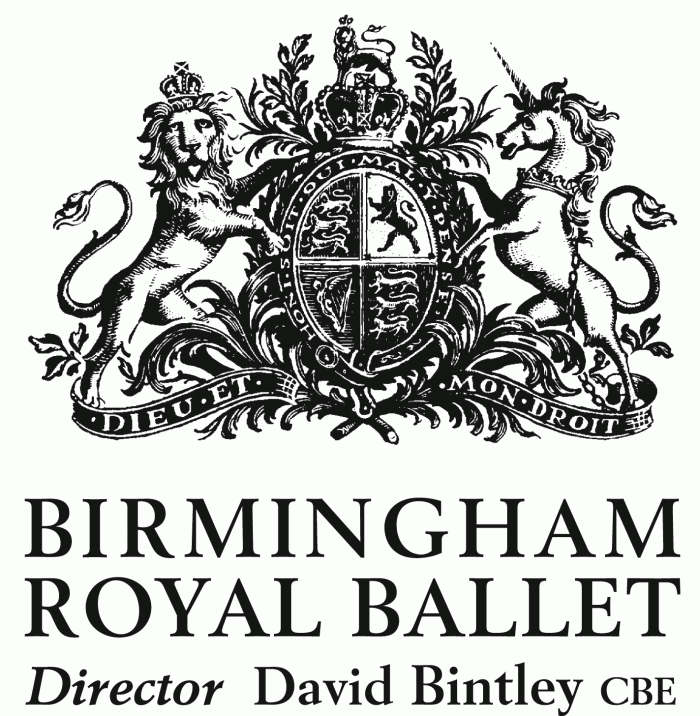 Tomorrow, 30 October, they are bringing a programme themed around Benjamin Britten. The ensemble will play his Three Divertimentos which use material that he wrote at the Royal College of Music. The programme also includes music by composers Britten revered, Mozart and Schumann, plus Bach's Violin Concerto in E major. In case you are wondering about string music by Schumann, the ensemble are playing artistic director's arrangement of Schumann's String Quartet No. 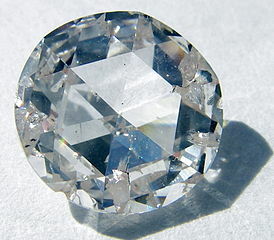 3 in A. Opera Rara’s developing relationship with BBC Radio 3 bore fruit this weekend with two events, centred on Donizetti rarities. On Saturday, BBC Radio 3 broadcast a recording of Donizetti’s Caterina Cornaro with David Parry conducting the BBC Symphony Orchestra, a recording which will be issued on Opera Rara in 2013. And last night at the Barbican, Sunday 29 October 2013, Sir Mark Elder conducted a concert performance of Donizetti’s Belisario again with the BBC Symphony Orchestra; the concert being the culmination of a week of recording of the work, again for Opera Rara. Belisario was given in concert, but semi-staged by Kenneth Richardson. The singers still used scores, but there were entrances and exits, dramatic lighting and a degree of interaction between the singers. Belisario was written by Donizetti just after Lucia di Lamermoor, with the same librettist Salvadore Cammarano, though the work is perhaps not quite as fully developed as Lucia, but Elder and his forces showed that Belisario contains some vintage Donizetti. 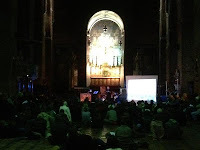 Not quite the opening event of this year's Brighton Early Music Festival but their 27 October event was very much a celebration of the start of the festival and its 10th anniversary. The concert was a free event in St. Bartholomew's Church, starting at 8.30pm with the audience free to come and go as they pleased; the whole programme repeated at 10.30pm. 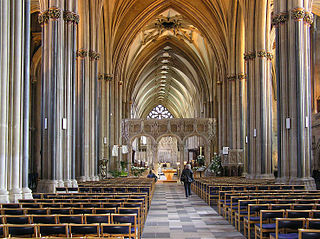 Chairs were pushed to the sides of the nave; those who were early were lucky enough to bag seats but the nave gradually filled up with people of all ages sitting casually on the floor. A sort of early music club night if you will, except the age range was far wider. BREMF had done an event like this last year as part of Brighton's White Nights. With no White Nights this year, they decided to go it alone, encouraged by the wide range of people who tried the open entry casual event. And indeed on Saturday there were a fine variety of both ages and styles. There were five groups playing, all taking part in BREMF's Brighton Early Music Live! 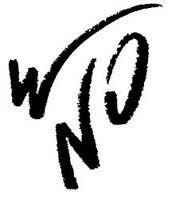 scheme, whereby the festival mentors a number of ensembles each year. The five represented a nice variety of styles of music, with some innovative thoughts on presentation. Each group got a slot of 20 minutes to play; programme notes were basic so I have no details of exact works. As the audience was being encouraged to listen with an innocent ear, I felt that I would review in the same manner and didn't approach the organisers to get a detailed work list. There is a lovely entry in Charles Burney’s diaries from when he visited Vienna in the 1770s. There he visited the elderly composer Johann Adolph Hasse (1699 - 1783) and his wife, the soprano Faustina Bordoni (1697 - 1781). The diarist seemed charmed by the composer and his wife, and paints a picture of elderly retirement which is relatively rare for the period. 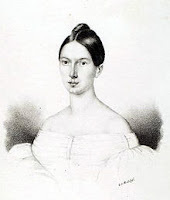 Hasse seems to have had a long life, with a successful marriage, in an age when artists did not always live long and certainly did not manage a comfortable retirement. So who was Hasse? He’s a composer whose name crops up, and whose operas seemed to be mentioned but rarely performed nowadays. He was probably one of the most successful opera composers of his age and one half of one of baroque opera's power couples. The short-list for this year's British Composer Awards has been announced. Sir Harrison Birtwistle gets two mentions, for his Angel Fighter in the vocal category (premiered by the BBC Singers and David Hill, with Andrew Watts and Jeffrey Lloyd Roberts at the Cadogan Hall) and his Violin Concerto in the orchestral category (commissioned by the Boston Symphony Orchestra for Christian Tezlaff). Jonathan Harvey's The Annunciation is in the liturgical category along with Cecilia MacDowell's The Lord is Good and Frances Grier's Missa Brevis. The other entries in the vocal category are Joe Cutler (Chanticleer and the Opera Fox for the Roald Dahl Museum) and Colin Matthews (No Man's Land for Ian Bostridge, Roderick Williams and the City of London Sinfonia under Stephen Layton), the others in the orchestral are Julian Anderson (The Discovery of Heaven premiered by the London Philharmonic) and Rebecca Saunders (Still for Carolin Widmann and the BBC Symphony Orchestra). Thomas Ades crops up in the chamber music category with The Four Quarters (for the Emerson String Quartet). 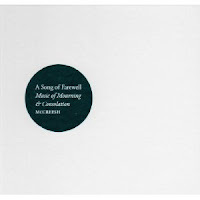 A Song of Farewell - Music of Mourning & Consolation is one of Paul McCreesh’s series of discs with the Gabrieli Consort exploring unaccompanied choral music of the 16th to 21st centuries. This disc is the first of such programmes to appear on McCreesh’s Winged Lion label. Previous programmes have been themed on spiritual pilgrimage and the Virgin Mary; this disc focuses on music for mourning and for consolation. The centre-piece of the programme is Howells' Requiem, which was written just before his son Michael died (the manuscript includes marks made by Michael). Howells reworked some of the material as Hymnus Paradisi but put both works away unperformed. Hymnus Paradisi was allowed out in the 1950’s but the Requiem was not allowed to be performed for another 20 years. It is a powerful and intimate work, setting a distinctive mixture of sacred texts. To Oxford's New Theatre for WNO's revival of Annabel Arden's production of Puccini's La Boheme. The New Theatre is a curious place, a 1930's cinema with very narrow foyer space and apparently no pit, as the orchestra were on the floor in the stalls (with seats removed). I did wonder what the balance would be like Wagner or one of the bigger Strauss operas. Listening to the overture, it struck me that it was a long time since I had seen this opera. And quite how perfect, of its kind, it is. It says a lot for the changes in concert going habits that have been wrought in the last few years or so, that the Tallis Scholars could perform a programme consisting of just two large scale polyphonic works and pretty near fill the Cadogan Hall. For the opening concert, on 25 October, of the Choral at Cadogan series, Peter Phillips and the Tallis Scholars performed Robert Fayrfax's Missa Tecum Principium and Thomas Tallis's Lamentations. Using just 10 singers to perform Fayrfax's large-scale five-part mass, the result was intensely serious and entirely engrossing. Fayrfax's music is still not regularly performed by contemporary groups (and the Tallis Scholars do not seem to have recorded his music), though he was a notable and influential figure in his day. He wrote in the early Tudor period, working for Henry VII and Henry VIII as a Gentleman of the Chapel Royal before any of the religious upheavals. 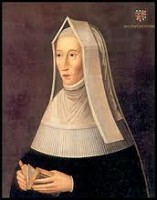 He possessed the patronage of Henry VII's mother, Lady Margaret Beaufort who commissioned his Missa O Bone Jesu, and he led the Chapel Royal at the Field of the Cloth of Gold in 1520. He was a major influence on John Taverner and on Thomas Tallis. On Friday 26 October, Anneke Scott will be performing at the Schott Recital Room in Great Marlborough Street, London as part of the launch of her new album Prelude, Caprices, Fantaisies - Concerts Caches. 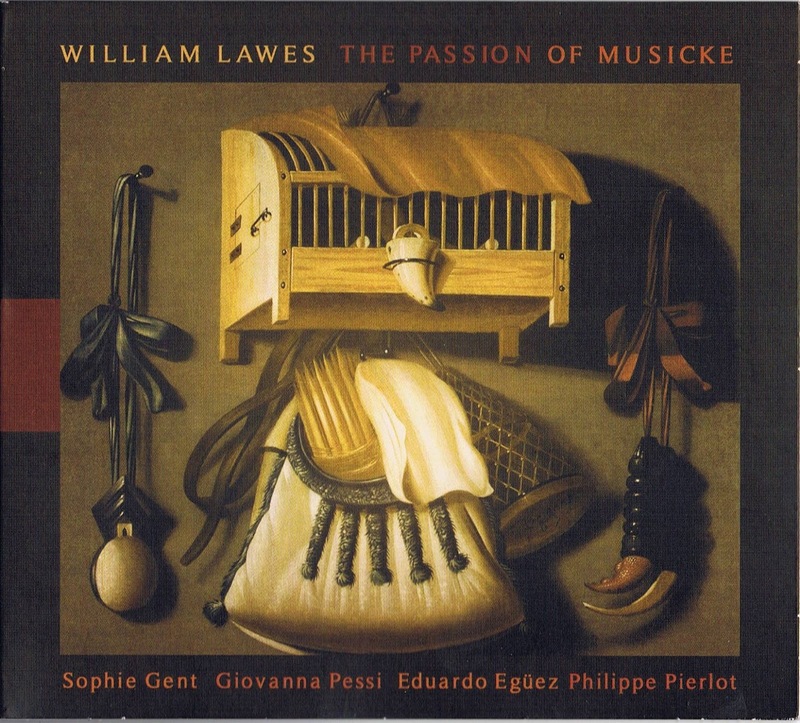 The album, released on the Resonus label, features music by the French 19th century composer and horn virtuoso Jacques-Francois Gallay (1795-1864). Scott has recorded the album on an 1823 cor solo by Marcel-August Raoux (loaned by the Oxford Bate Collection) which is identical to Gallay's own instrument. The concert, at 7pm, will feature unaccompanied music for horn by Gallay. Not only have we had the premiere of a Beethoven piano sonata, but now a second piece will receive what is believed to be its premiere today. 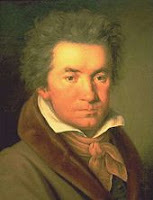 Students from Manchester University will be today performing a hymn written by Beethoven in 1820. It was discovered by Professor Barry Cooper, a musicologist from Manchester University; Cooper is also the author of the volume on Beethoven in the Master Musician's series and is the general editor and co-author of the Beethoven Companion. Cooper was working in Berlin on the sketches for Beethoven's Missa Solemnis and found the hymn amongst the sketches, apparently unnoticed. It is presumed that Beethoven wrote the hymn for Archduke Rudolf of Austria, for whom Missa Solemnis was written. The hymn is an organ harmonisation of the Latin Pange Lingua with the first line unaccompanied, which is probably why no-one ever noticed it before. 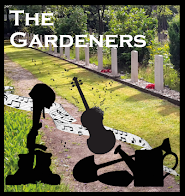 It will be performed today at 2.30pm at the University of Manchester's Martin Harris Centre and will be published in the journal of the Royal Museum Association. Further information from the Manchester University website. Beethoven's early piano sonata, Sonata Fantasia in D, was premiered earlier this week by young pianist Martin Oeiat at Amsterdam's Concertgebouw after being reconstructed by Dutch Beethoven musicologist Cees Nieuwenhuizen. Nieuwenhuizen's reconstruction is based on the existing 1100 bars of music from the 'Kafka' Sketchbook, published in 1970. Neither of these pieces is quite earth shattering, but it is fascinating that a composer as well known and as well studied as Beethoven can still have new pieces come to light. You wonder what else is hidden, unnoticed or uncatalogued, in the world's libraries. 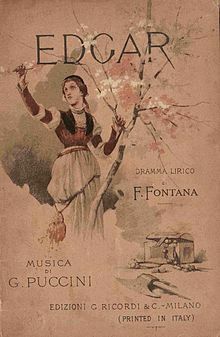 Puccini wrote his second opera, Edgar, in 1889 and it was premiered at La Scala, Milan. Based on a play by Alfred de Musset it features a young man torn between the love of a pure girl, and passion for a gypsy. Sounds familiar? The opera was tepidly received, and Puccini revised it twice, the second time reducing the four acts to three. It was even less successful in the revised form and Puccini abandoned it, using some of the music for Tosca. Now the enterprising New Sussex Opera are giving the UK premiere of the original four act version, with a strong cast, featuring John Hudson and Mary Plazas, conducted by Nicholas Jenkins. 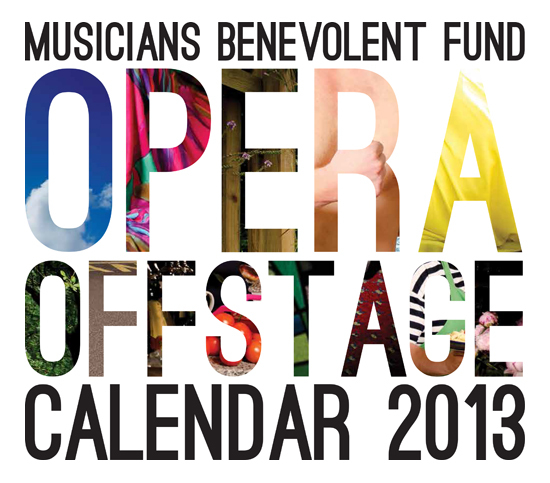 The Musician's Benevolent Fund have just launched their Opera Offstage calendar featuring jokey images of well known opera singers off the operatic stage, including John Tomlinson as Father Christmas, Sarah Walker in her private pool and Nicky Spence getting a tattoo. Singers featured include Renee Fleming, Susan Bullock and Richard Berkeley Steele, Gerald Finley, Lesley Garrett, Susan Bickley, Dame Felicity Lott and Duncan Rock, Rebecca and Bonaventura Bottone, Gerald Finley, Jonathan Lemalu (and son), and Duncan Rock . The calendar was Nicky Spence's idea, he is an ambassador for the Musician's Benevolent Fund, having received support from them during his studies. Helping young musicians at the start of their careers and professional musicians threatened with accident, illness or injury, the MBF last year saw an 80% increase in applications from musicians in need of its assistance. 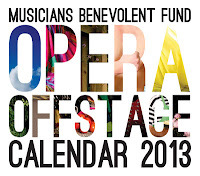 The calendar is £12 and can be bought direct from the Musicians Benevolent Fund website. Tenor Joel Prieto will not be entirely unknown to Londoners, he shared a Rosenblatt Recital in 2010 and was Fenton in the recent Falstaff at Covent Garden. His return to Rosenblatt Recitals for his first complete recital, on 22 October, also saw him making his Wigmore Hall debut, with Iain Burnside at the piano. Prieto is Spanish born, raised in Puerto Rico and trained in New York. His recent repertoire, besides Fenton, has included Ferrando and Don Ottavio and plans include Don Pasquale and L’elisir damore. He has a lovely lyric tenor voice, which he showed off with imagination in a recital that took in Mozart and Beethoven plus composers from Puerto Rico and Latin America. 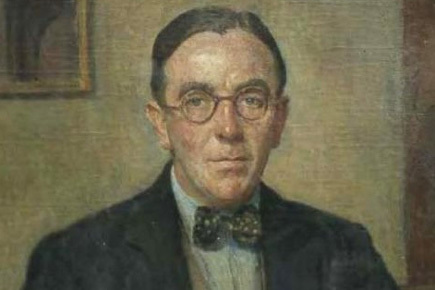 The Royal College of Music is holding a one day seminar on the RCM student and professor John Ireland, John Ireland: English Impressionist, on Saturday 1 Nov 2012. Sessions include Ireland at the College, Ireland and the Piano and Ireland and Poetry. The day will look at Ireland's college connections and his whole catalogue of works, Speakers include Paul Spicer and David Owen Norris, with masterclasses from Leon McCawley and Stephen Varcoe. The day-time events conclude with a round table discussion, Ireland Now, with Anthony Payne, Lewis Foreman, David Owen Norris and Jeremy Dibble. This is followed by a concert of Ireland's songs and piano works. There will also be an exhibition of Ireland's manuscripts. Further details from the Royal College of Music website. The event is free but tickets are required. Ronald Corp, the composer, conductor, Anglican priest and educator extraordinaire, has been awarded an honorary degree by Anglia Ruskin University (full citation on their website). He founded the New London Orchestra in 1989 to promote 19th and 20th century music. With them he has recorded an influential series of CD's of British light music; his most recent concert with the orchestra was a concert performance of Delius's A Village Romeo and Juliet to celebrate the composer's 150th anniversary. He also founded the New London Childrens Choir with the aim of introducing young people to both the challenges and the fun of singing and performing. 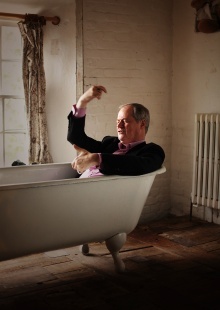 A widely performed composer (see his website for more details) he was awarded the OBE for services to music in 2012. First Live - how to interest young people in live orchestras? How do you interest young people in live classical music. One admirable way is of course to encourage them to play an instrument. Though not every young person actually wants to do this and frankly there just isn't the capacity. Many local authorities are hard pressed to give access to music to those children who want it, never mind the ones who are less interested. Another method is to widen the idea of what we mean by music, so that young people get involved in live musical activities but with a more popular bent. But this still leaves them without any knowledge or interest in live orchestral music. So the charity Orchestras Live have come up with a new idea, First Time Live. With the delightful name of McOpera, the musicians of the Orchestra of Scottish Opera are marketing themselves as musicians co-operative. Last year's restructuring at Scottish Opera resulted in the orchestra being made part-time and this latest move is aimed at providing a new business model to help keep the orchestra together. McOpera, which currently has 53 of the orchestral musicians on board, will offer ensembles of varying sizes for hire, ranging from small instrumental groups to a large orchestra all taken from the pool of musicians available. 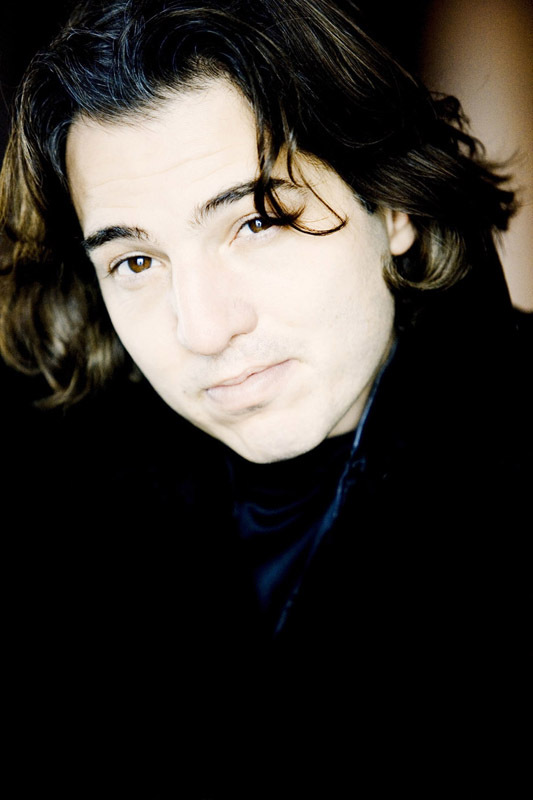 I wrote earlier about Turkish pianist Fazil Say's prosecution in Turkey for comments on Twitter. He appeared in court in Turkey on Thursday 18 October charged with insulting Islam; he is defending himself. The charges arise from jokey tweets which the pianist made earlier this year. Say has rejected the charges, calling for his acquittal. If found guilty he faces a maximum sentence of 18 months, which will probably be suspended. Say has said in public that he is an atheist and also that he plan's to move to Japan. Say's forthcoming engagements, as listed on his website, include a residency in Frankfurt (with the Istanbul Symphony Orchestra and the Haba Quartet), the 13th Antalya Piano Festival and appearances with the Bern Symphony Orchestra and the Vienna Symphony Orchestra. 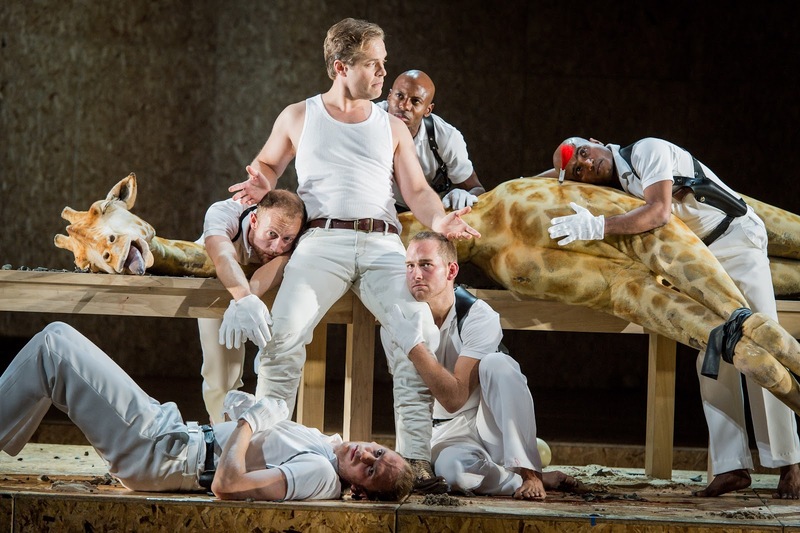 Opera North have announced the operas for their Summer 2013 season. Charles Edwards with be directing and designing Handel's Joshua, conducted by Stephen Layton with Fflur Wyn, Jake Arditti and Henry Waddington. 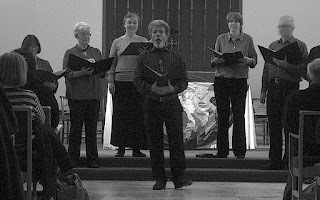 More staged oratorio (see my article on staging Jephtha). Will be interesting to see what Edwards makes of Joshua. It is frankly, not one of Handel's most operatic works, being a rather bloodthirsty series of victories with minimal characterisation. He and librettist Thomas Morrell were evidently trying to re-capture the success of Judas Maccabeus. Then Giles Havergal is directing a new production of Albert Herring with Josephine Barstow as Lady Billows. The production will not be in the Leeds Grand Theatre but in the smaller Howard Assembly Rooms, which should make for an interesting re-balancing of the opera, which Britten wrote for small scale touring. Conductor Richard Farnes will be at the helm for the concert stagings of Wagner's Siegfried at Leeds Town Hall with Estonian tenor Mati Turi and Swedish soprano Annalena Persson with Michael Druiett as the Wanderer. Further details from the Opera North website. On 26 October, Classico Latino will be performing at the Union Chapel. The concert will be the launch of their new album Latin American Classicas: A Musical Journey Through South America. 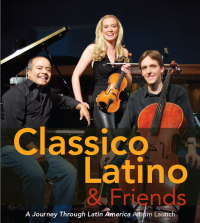 Classico Latino is a trio which plays Latin American Music on western classical instruments, with cellist Graham Walker, violinist Lizzie Ball and pianist Ivan Guevara. The new album features guest appearances from a number of musicians including the Gentlemen of the choir of St Johns College Cambridge, and Columbian singing star Andres Cepeda. I have to confess that I was rather nervous of the idea of Michael Keegan-Dolan’s new Julius Caesar at the London Coliseum. By the time we saw the production (Friday 20 October) there had been enough reviews out for me to have my prejudices confirmed. In the event, I found the performance completely engrossing and one of the most stimulating performances of a Handel opera that I have seen in a long time. Though UK opera houses admirably perform Handel’s opera serias, there is a tendency to fill the stage with business, whether from fear of the large open spaces of Handel’s scores with their long arias, or simply from a need to keep the audience entertained. To get straightforward, direct productions you have to go smaller companies such as English Touring Opera where James Conway has produced an admirable series of Handel’s opera seria. Of course there was nothing strictly simple about Keegan-Dolan’s new Julius Caesar. 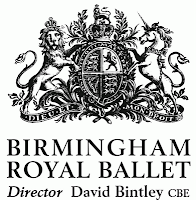 Birmingham Royal Ballet arrive in London on Tuesday (23 October) for a short season of ballets at Sadler's Wells Theatre.They are not bringing their production of Swan Lake which is currently being toured to other venues. Instead we have six one-act ballets spread over two evenings with a mix of old and new. Hans van Manen's Grosse Fuge will be familiar to many and it is being teamed with two recent ballets. Lyric Pieces by American choreographer Jessica Lang, to music by Edvard Grieg, and Take Five, David Bintley's ballet to music by Dave Brubeck. American film and show choreographer Joe Layton's The Grand Tour opens the second evening. It pays homage to the 20's in amusing fashion and uses music by Noel Coward.. It is teamed with Faster, and The Dream. Faster is the second collaboration between David Bintley and Australian composer Matthew Hindson and is a tribute to the London 2012 Olympic Games. The Dream is of course another older masterpiece, Frederick Ashton's perfect jewel of compressed story telling and lyricism. More details from the Sadler's Wells website. 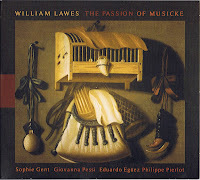 My review of The Passion of Musicke, a lovely disc of Harp Consorts by William Lawes is here on MusicWeb International. Substantial and supremely rewarding ... consummate playing. Some projects you read about and simply wonder why? Why would they want to do that and who on earth thought it would be a good idea. 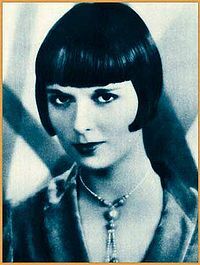 As part of the Young Vic's 2012/13 season, there are details of American Lulu which is being performed there in September 2013. 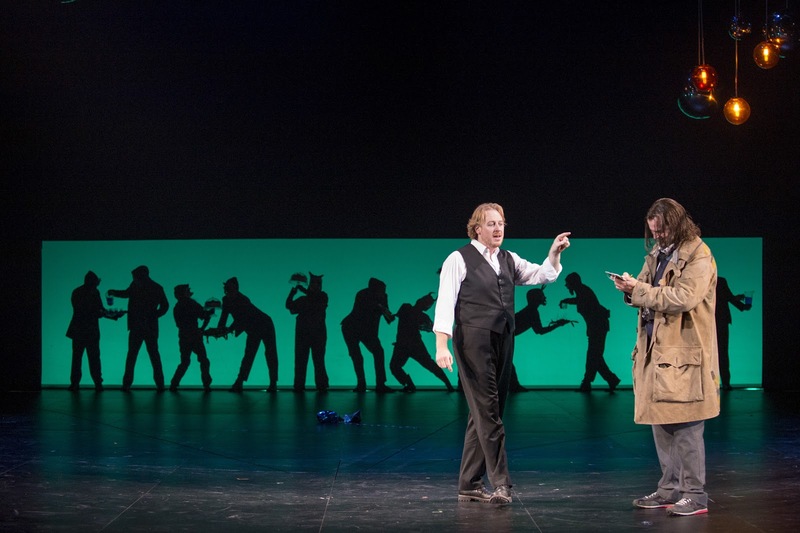 A co-production with the Opera Group, Bregenz and Scottish Opera in association with the London Sinfonietta, it promises to be a version of Berg's Lulu set in New Orleans. But not Berg as we know it; we are promised a 'radical reworking of Berg's unfinished opera', composed by Olga Neuwirth and directed by John Fulljames. Oh dear. I have to confess that until I read about the forthcoming recital of Viktor Ullmann song at St. Johns Waterloo I had never heard of the Inside Out Festival. It is running from 22 to 29 October and this year is the third festival. The aim is to celebrate the contribution of London nine universities to cultural life. There are a wide variety of events, music, talks, exhibitions, workshops etc. Performances take place at the various campuses in and around London. Following on from their performances of Viktor Ullmann's astounding opera The Emperor of Atlantis (see my review), English Touring Opera are promoting a recital by soprano Paula Sides (who appeared in ETO's performances of Ullmann's opera). Accompanied by pianist Jonathan Gale, Sides will be singing songs by Ullmann, celebrating the composer's life and work. The concert is on Tuesday 23 October at St. John's Waterloo. It will be followed by a discussion about Ullmann, the historical context of his works and the art of Terezin. If you thought that The Emperor of Atlantis was amazing, then this is your chance to explore Ullmann's work further. His catalogue runs to some 40 opus numbers, plus a startling 20 or so works written whilst he was in Terezin. The concert is part of the Inside Out Festival, further details from the festival website. An intriguing concert in London tomorrow night (19 October), at St James' Church, Piccadilly. The Moscow Svyato-Danilovsky Monastery Choir will be performing Russian sacred music and poetry. The concert 'is dedicated to the 50th anniversary of the Diocese of Sourozh and 5th anniversary of the Reunification of the Russian Orthodox Church in the Motherland and abroad.' Suffice it to say that the Svyato-Danilovsky Monastery (the St Daniel Monastery) is in Moscow, it was founded in the late 13th century by Alexander Nevsky's son, Daniel. It was one of the last monasteries to be closed under the Soviet regime, in 1929, and the first to be restored to the Orthodox Church, in 1983. 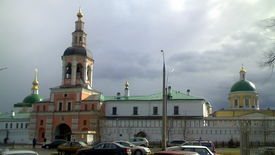 It is now the headquarters of the Russian Orthodox Church. No detailed programme is available, but there are more details on the concert from St. James' Church website, more information on the monastery from its website, where there are pages in English. There is now a review on the Bachtrack.com website of FifteenB's gig at the Herne Hill Festival on Saturday. To Berry Bros & Rudd in St. James' Street yesterday for the launch of The Grange, Richard Osborne and Wasfi Kani's new book about Northington Grange, the house which hosts Grange Park Opera each summer. 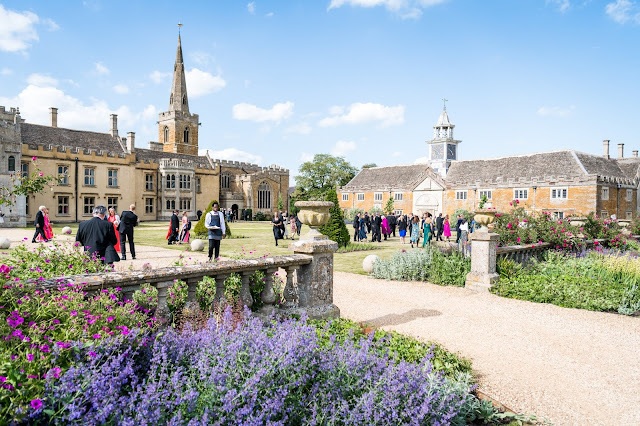 The house, currently owned by Lord Ashburton, is of great historical interest and has been through a great many vicissitudes in the 20th century. The book aims to fill in the gaps, with a glorious selection of 250 pictures and Richard Osborne's linking narrative. 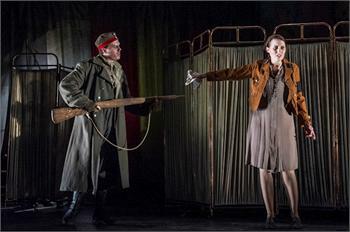 ENO have revived theatre director Rufus Norris’s 2010 production of Don Giovanni, which was Norris’s operatic debut. 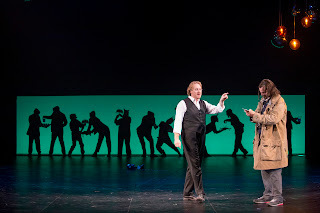 Bringing in directors from outside the operatic world has always been a way of introducing interesting and innovative ways of thinking about opera, but does not guarantee it. Sometimes operatic inexperience can generate something truly innovative, but other times just a mess or even worse. Norris is musically literate and has staged musicals but Don Giovanni was his first attempt at a full opera. He avoided the worst solecisms and did not make the mistake of staging the libretto rather than the music. Of course, with this revival, there was also the chance to tidy things up a bit as well. 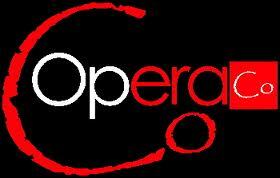 Co-Opera Co have announced their 2012/13 season of training and development workshops. The company is dedicated to helping professional singers and other opera professionals at the early stages of their career. In addition to their annual season of operas, they arrange workshops with distinguished practitioners. This year they have some pretty impressive names giving workshops, Rosalind Plowright, Diana Montague, David Rendall, Toby Spence, Ryland Davies and John Graham-Hall. 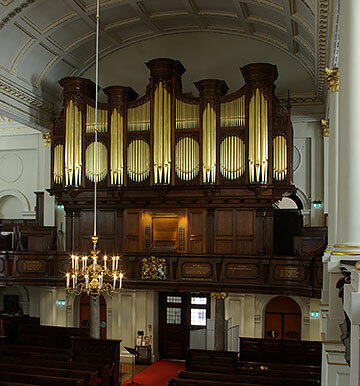 The London Bach Society and the Royal College of Organists' London Organ Forum are presenting a one-day event at St. George's Church, Hanover Square on Saturday 3 November. Entitled Hearing Bach's Voice: Organ, Chorale and Passion, the event is a mixture of talks, discussions, a masterclass and a concert. There is even a chance for the audience to join in at the evening concert. 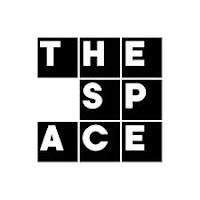 The Space, the new digital arts website developed by the Arts Council and the BBC, is to continue in its present form until March 2013. In its first six months of existence the service provided free, live and on demand content to 900,000 visitors and enabled people to experience events from London 2012 which they would not have been able to do live. The service was intended by the Arts Council to help build digital skills within the arts. The Arts Council supported The Space with £3.5 million in new commissions. Whilst everyone praises the website as a shining example, such things don't come cheap and the Arts Council invested over £8 million. A comprehensive evaluation has been commissioned with results due in the new year; sounds ominous. The London Handel Players are the resident house band for the London Handel Festival, performing a number of concerts each year at St. George's Square, Hanover Square and Wigmore Hall as part of the festival, including accompanying the performances of Handel's oratorios and dramatic works. 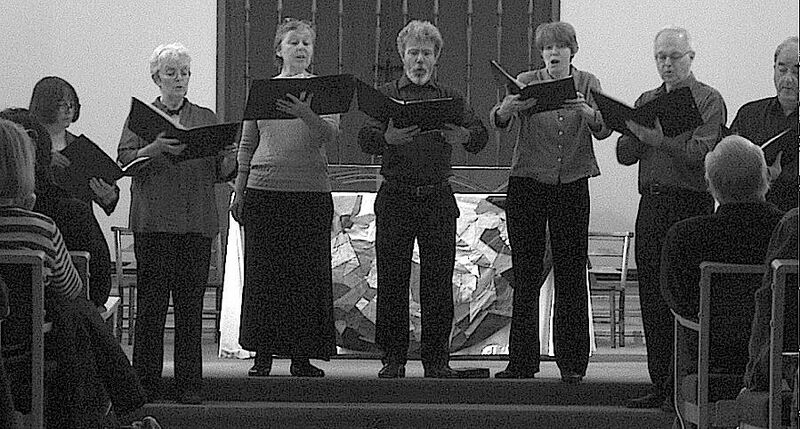 The group made their debut at the 2000 London Handel Festival. They also have a life outside the festival and will be making an appearance in Oxford tomorrow, 17 October. Opera Holland Park has announced its productions and dates for next season. Cav and Pag - first night June 4, Madama Butterfly - first night June 8, Les Pecheurs de Perles - first night June 25, L'Elisir d'Amore - first night July 16, and of course the production that we are all waiting for, Wolf-Ferrari's I gioielli della Madonna (with Natalya Romaniw) - first night July 23. The Christine Collins Young Artists will be performing Madama Butterfly on June 14. Further information from the Opera Holland Park website. The Incorporated Society of Musicians (ISM) has started their Bacc for the Future Campaign to persuade the Government to remedy plans for the the EBacc. Currently, plans indicated that the English Baccalaureate will require a pupil to have achieved a certificate in five subject areas, maths, English, sciences, languages (ancient and modern) and humanities (defined as only history or geography). This leaves music and the other practical arts out in the cold, with no incentive for the pupils to study them. There are already indications that such a change might have a poor effect on the number of children studying music. David Poutney's tenure at Welsh National Opera was always going to be interesting and now the company's programme is taking a striking new direction with the production of a group of contemporary works, all UK premieres, over the next few years, in a series entitled British Firsts. We already knew that WNO were giving the UK stage premiere of Jonathan Harvey's Wagner Dream (given its first UK performance at the Barbican in a semi-staged production). Thanks to a $2 million gift from the Getty Family, there are now a selection of others in the following years. The Nash Ensemble opened their 2012/13 season at the Wigmore Hall last month with a pair of programmes featuring British music from the first half of the 20th century, Bax, Britten, Bridge, Grainger, Bliss, Quilter and Elgar. 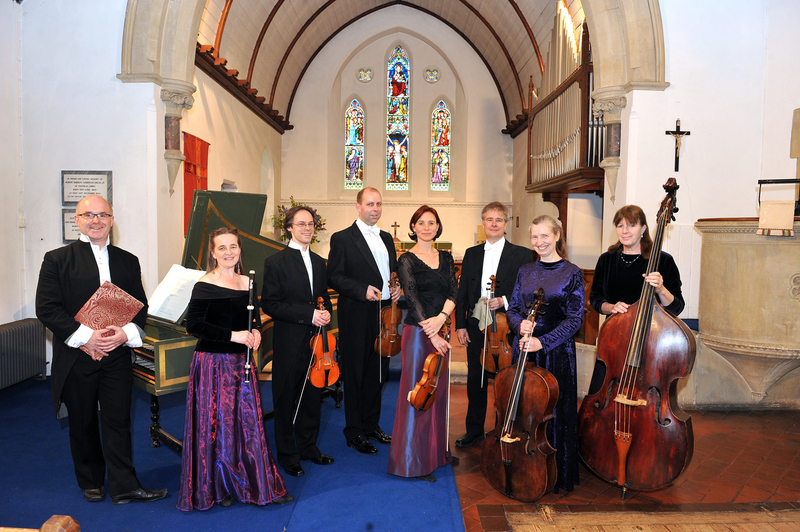 Their season continues in a similar vein on Saturday 27 October with tenor John Mark Ainsley, and Ian Brown, piano, in a lovely concert which includes Britten's Three Divertimenti, music by Bridge, songs for tenor and string quartet by Warlock, some of Elgar's lighter chamber music and RVW's On Wenlock Edge. There are 10 concerts in all in the season, with some very delectable music to come. Photos of us performing on Saturday at the Herne Hill music festival. The full set can be seen on the Festival's Facebook page. The singers who were the great stars of Handel's day were not the sopranos or the tenors, but the castrati. There were only ever one or two at the prime position, and these men could command huge salaries and generate amazing public enthusiasm. Handel worked with a number, but he never managed to work with the best known castrati of the day Farinelli. There just two who had a significant role in his operas, Senesino and Carestini. Senesino created the most remarkable number of roles for the composer. Francesco Bernardi (1686 - 1758) was the son of a Siennese barber so, not unnaturally his stage name was Senesino. He started in the Sienna Cathedral choir, made his stage debut in Venice in 1707 and by 1717 was creating quite a stir whilst singing in Dresden. His salary in Dresden was huge and even included the use of a carriage. He objected to his part in the opera Flavio Criso by the Dresden court composer Heinichen in 1720; this meant that when Handel came by, looking for singers for the Royal Academy in London, Sensino agreed to join him. 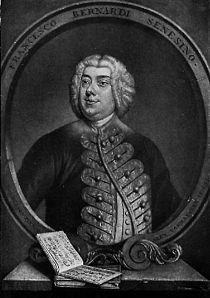 Handel had heard him singing in Dresden (in 1719 in Teofane) and had been instructed by the directors of the Royal Academy to try and engage him. 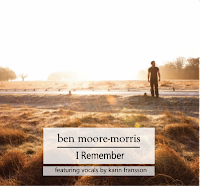 Ben Moore-Morris is a young pianist/songwriter/composer who has just released his first album I remember eleven tracks each of which features Moore-Morris’s piano playing along with Karin Fransson’s vocals. 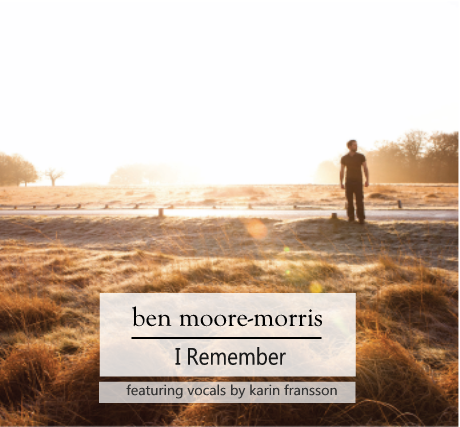 Moore-Morris is a self taught pianist with an interest in film music and his web-site describes him as a cinematic composer. The disc has eleven tracks on it, all reassuringly long (over five minutes) with an indication that Moore-Morris is not frightened of trying to develop his material, in fact I would rather have liked a couple of seriously long tracks with substantial, more highly developed pieces on them. Of the eleven tracks, five are purely instrumental. Well, its my turn in the spot-light tonight. Rather than writing about a performance, I'll be performing myself with my ensemble the FifteenB Consort. Being as there are only seven of us performing, we'll be very definitely in the lime-light. The centre-piece of the concert is Palestrina's glorious six-part Missa tu es petrus, I never like performing mass setting at one sitting, so the concert is structured like a mass, with plainchant propers and motets based on the propers. To provide further punctuation, clarinettist Peter Cigleris will be playing some unaccompanied music for clarinet, Malcolm Arnold, Anton Stadler, Harvey/Gershwin and Stravinsky (at the positions in the mass where you'd normally get the sermon and the consecration). We are including Stravinsky's three Latin motets to complement the clarinet pieces. Its all at 7.30pm tonight at St. 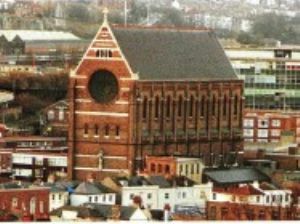 Faith's Church, Herne Hill, part of the Herne Hill Music Festival. More details at my website. To Bristol yesterday for a concert at Colston Hall. As we made good time travelling from London, we took advantage to catch Evensong at Bristol Cathedral sung by the lay clerks under Mark Lee. The Magnificat and Nunc Dimittis were by Humphrey Clucas (born 1941), whose music I had not come across before. He seems to have been a lay vicar at Westminster Abbey. The setting was unaccompanied and written with a nice practicality, suitable for an ensemble of just 7 men; though perhaps it did sound as if the composer had rather OD'd on Vaughan Williams before writing it. The anthem was In Manus Tuas by John Sheppard, a perfect piece of early Tudor polyphony, beautifully sung as the sun was setting. I have to confess to not having heard of Cafe Oto, and then it cropped up twice. First as a venue for a recent performance of the Cage Song Books and now as a result of them getting the inaugural Genesis prize. The cafe is based in Dalston and acts as a cafe during the day, then in the evenings host an eclectic programme of adventurous live music. 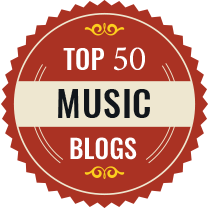 Their website says that they were created in 2008 with the aim of providing a home for creative music that lives outside the mainstream. Their programme for the next month is eclectic and well worth exploring. Tonight's recital at Bristol's Colston Hall, Diamond Songs, is organised by the English Poetry and Song Society and being given by Sarah Leonard and Stephen Varcoe, with Nigel Foster on piano. 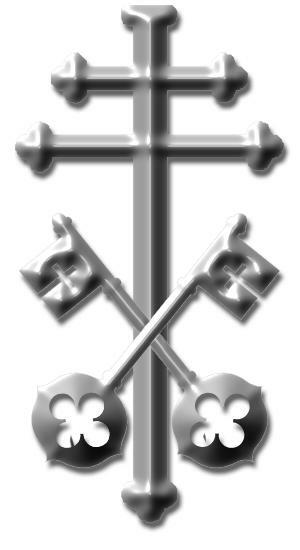 The theme of the concert is composers who were Master's of the King's (or Queen's) Music. My special interest is that the concert also includes performances of the four finalists in the English Poetry and Song Society's Diamond Jubilee Composition Competition and my song For David on His Birthday is amongst them (You can hear the tenor version of the song on Sound Cloud). Read on for the complete programme. Autumn Festival in Queen Anne's Footstool.